It’s almost that time again, folks! The 2017 DockDogs® World Championship is only weeks away! Have you booked your hotel? Packed your bags? DECORATED YOUR CAR?! That’s right! Decorate your car! Every year, DockDogs® hosts a Window Decorating Contest. 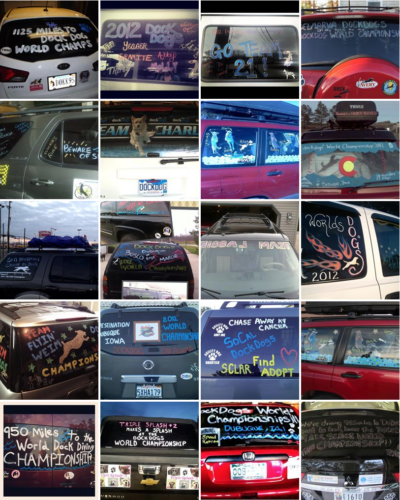 Decorate your vehicle with window paint, window markers, even customized decals! Let everyone know that you’re on the Road to Worlds without saying a word! But wait, THERE’S MORE! Now that your vehicle is Worlds Ready, SHARE IT WITH US! You could win! Will it be 200 DockDogs® Credits, a fully paid membership for the 2018 season? You’ll find out at the Golden Paw Award Show when the winner is announced! Images must be submitted via email socialmedia@dockdogs.com. Images must be submitted by Wednesday, October 25, 2017 at 8:00 PM EST. 1st Place Winner will be announced at the Golden Paw Award Show, Friday, October 27, 2017. Winners (top 3) will be featured on DockDogs® Official Blog at dockdogs.com. 1st Place will be awarded a prize! Thank you to all who participate and good luck!